In this tutorial, I will explain you about displating the stock message in AbleCommerce. If you've got inventory tracking enabled in AbleCommerce and you're out-of-stock on a selected product, AbleCommerce switches to “View Mode” on the product page, and removes the add to Cart button. If you don’t have your stock status messages enabled, your customers could surprise why they can’t order this specific product. enabling the stock status message and out-of-stock message needs a simple setting change in the admin. In the admin area, use the main menu to go to Configure -> Store -> General. In the right-hand column is the Inventory Control section. 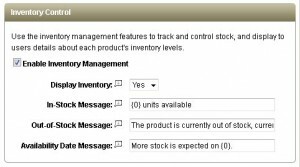 Change the “Display Inventory” selection to “Yes” and then review the In-Stock Message, Out-of-Stock Message and Availability Date Message values. Click the Save Settings button at the top of the page to commit your changes. Verification On the front-end, navigate to a product that has inventory tracking enabled and verify that you see the stock status message. If you are still not seeing the message, there may be more at play. It is possible that when your store was customized, the code to show the stock level was commented out or removed. In that case, if you are comfortable working with the AbleCommerce code pages, you can look for the commented out code in and restore it. You may also need to compare your control against an unmodified version if the block has been removed completely. If you aren’t comfortable doing this, Application X can assist you with restoring the missing functionality. Sometimes, you may only want to display the inventory level when it reaches a specific level – maybe at your re-order mark, a store-wide fixed quantity, or even at a per-product level. Application X has customizations that we can install into your AbleCommerce store to provide this exact functionality or customize to meet your specific requirements. HostForLIFE.eu receives Spotlight standing advantage award for providing recommended, cheap and fast ecommerce Hosting including the latest AbleCommerce. From the leading technology company, Microsoft. All the servers are equipped with the newest Windows Server 2012 R2, SQL Server 2014, ASP.NET 4.6, ASP.NET MVC 6.0, Silverlight 5, WebMatrix and Visual Studio Lightswitch. Security and performance are at the core of their AbleCommerce hosting operations to confirm every website and/or application hosted on their servers is highly secured and performs at optimum level. mutually of the european ASP.NET hosting suppliers, HostForLIFE guarantees 99.9% uptime and fast loading speed. From €3.00/month , HostForLIFE provides you with unlimited disk space, unlimited domains, unlimited bandwidth,etc, for your website hosting needs.